It’s important to know how much you return you will get from your investments. 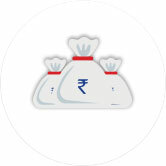 DHFL FD Calculator analyses how much your deposit investment can mature overtime, with interest. The online FD interest rate calculator provides an estimation of the growth of your investment in the selected term, so you can manage your financials well. Furthermore, the FD interest calculator values your rate of return on the basis of interest rates. Calculate your investment opportunities online now, or visit our branches all over India to know more.